Happy Valentine’s Day! I pray that you are all feeling blessed by your loved ones this day! Here I am following my fellow blogger Jennifer’s post on “Blood is Thicker Than Water and Other Misrepresentations of Family Life.” While Jennifer has given us her amazing perspective as an adoptive parent, I’m going to give you one individual adoptee’s perspective on adoption. 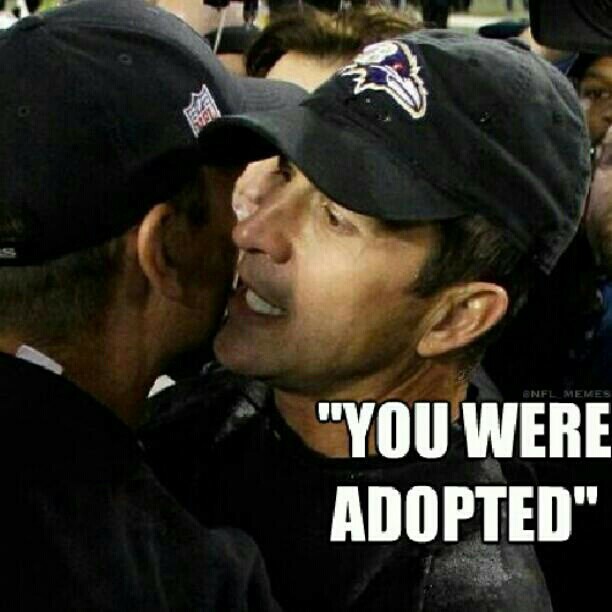 For those of you who do not follow football, this picture depicts John Harbaugh (coach of the Baltimore Ravens…SUPER BOWL CHAMPIONS..sorry couldn’t resist;-), telling his brother, Jim Harbaugh (coach of the San Francisco 49ers), that he’s adopted. I have to admit that when I saw this, I laughed. But, this picture also got me thinking. The overall theme is that finding out that one is adopted would be a bad thing. When I was growing up, I remember watching shows where the characters, children, were plagued with fear about the possibility that they were adopted only to be relieved when they found out otherwise. At the time, I wondered why these characterizations were even made. What was so bad about being adopted? So, what does it mean to be adopted? One thing I can tell you is that I know nothing different. From my earliest memories, I have known that I was adopted. My adoptive parents shared that information with me from the start. They chose me out of all of the other children in the world. I was not the only member of my family to be chosen. My brother was chosen before me, and my cousin was chosen after me. When I was younger, it never really occurred to me what it would be like not to be chosen; it never occurred to me what it would have been like if I had never been born. As the reality of my existence has become clearer, I have grappled with what it would have meant not to exist. I was born before the Roe v. Wade decision, and abortion was illegal. But, abortions could be arranged. What if I had been aborted? When thinking about the impact of my non-existence, it’s far reaching. I mean, my husband would not be married to me, and my three sons would not exist to leave their mark on the world. I have been a teacher for over 20 years; I would like to think that I have positively impacted many of the hundreds of students that I have taught. Then, there are the other people in my life: friends, co-workers, acquaintances…they would not know me. As an adoptee of my generation, there have been other considerations to think about as well. Why didn’t my birth mother keep me? Should I try to make contact with her? What about my birth father? What was his role in all of this? Should I make contact with him? Did he know? What impact will contacting my birth parents have on my adoptive parents? I have been blessed to have answers to many of these questions, and may in a future blog address those answers. For now, what I’m attempting to convey is that this individual has thought extensively about the meaning and implications of my own adoption. In the process, I have come to the realization that my life is ordained. God ordained my life. I am here for a reason. I have a purpose. As a result of that realization, I have chosen to embrace and LOVE What IS! After all, how we interpret our circumstances is up to each of us. There is no other way for me to feel but blessed to have been given life. There are NO accidents when it comes to life. No matter what your opinion is of another human being, we are all ordained to be here for such a time as this! I believe you have likely captured the thoughts of many adoptees as they have grown up ~ what would have been if different decisions had been made? It is my hope that everyone (adoptees, adoptive parents, birthparents, adoption agencies, and the community outside of adoption) understands that the adoption process goes far beyond the concept of “keeping” and “giving away.” It is a very difficult, heart-wrenching decision for birthparents to make and is not one made easily. These parents have taken a lot of time and reflection to arrive at the decision to make an adoption plan. In many cases, they are working very closely with an adoption agency or other community organization to process their thoughts and make the best decision. Those who are adopting go through a long, arduous, and invasive process to do so (a much longer labor than those who give birth!) and one that is also based on a lot of thought and preparation. Using “positive adoption language” honors this special way to build a family and acknowledges everything that is involved from all parties to make it happen. I cringe whenever someone asks me if my son knows his “real mother.” Yes, indeed he does — and she’s right here in front of you! This Valentine’s Day I want to express my love for my beautiful, amazing son; my strong, faithful, and loving husband; those among our families and friends who have supported us through our adoption journey; and the agency we worked so closely with to make it happen. Most of all, though, I express my unending love, gratitude, and respect for Andrew’s birthmother who made such a difficult decision. We have been blessed with such a precious gift.